The painter who lived and worked in Kraków is considered the finest representative of historicism in Polish painting and founder of the national school of historical painting. Painter, founder of the national school of historical painting. The genre of historical painting was to play a special role in a nation whose political sovereignty had been denied by the partition treaties of 1772-95. Jan Matejko (born 1838 in Kraków, died 1893 in Kraków) showed the former grandeur of the Polish Republic and the glory of its armies to lift the hearts and minds of Poles and to resurrect faith in the restoration of an independent country. The first one to elevate historical painting to such heights, he managed to fascinate wide social circles with it, to demonstrate the unique character and high artistic standards of Polish art internationally and to win top prizes at exhibitions in Paris, Vienna and Berlin. As a member of a number of prestigious Academies and Institutes of Art, he joined the ranks of the finest European painters of the second half of the 19th century. Although Matejko's father was a Czech emigrant who settled in Poland around 1807 and his mother came from a German-turned-Polish family, the Matejkos' Kraków home had a Polish, patriotic atmosphere and cultivated pro-independence ideas. Jan's two brothers fought in Hungary at the time of the Springtime of Nations. His imagination and interest in history was considerably influenced by his older brother Franciszek, associate professor of auxiliary sciences of history and employee of the Jagiellonian Library. Of significance was also the atmosphere of Kraków with its monuments of the past going back to the Middle Ages, its national sanctuary at the Wawel Hill with the Royal Castle and graves of Poland's rulers inside the Cathedral, and the relatively large freedom to cultivate national traditions compared with the areas of Russian and Prussian rule. By the time he enrolled at the Krakow School of Fine Arts, Matejko had already defined his area of interest. He continued to expand his historical knowledge by studying old chronicles and developed his passion for documentary drawing by penciling the images of Polish kings and princes, Kraków's architecture, sculpture and decorative art objects. Under the influence of the School's Wojciech Korneli Stattler, Matejko acquired a strict drawing discipline, an accurate way of approaching the painting area and a serious attitude to art, which he understood as a vocation and a national mission. His other Kraków teacher, Władysław Łuszczkiewicz, fuelled his interest in history and built respect for monuments and objects of the past. In December 1858, having obtained a grant to continue his education abroad, Matejko left for Munich. For seven months he studied there under Hermann Anschutz at the Academy of Fine Arts. He spent a lot of time at the Alte and Neue Pinakotek, studying works by old masters and contemporary representatives of German academism. He was fascinated by the historical paintings of the French artist Paul Delaroche. In 1860 he enrolled at the Academy of Fine Arts in Vienna, but, dissatisfied with the guidelines provided by Professor Christian Ruben during the review of his portfolios, soon gave it up. His beliefs and attitude to art matured in the circle of Kraków's bohemia of the early 1860s, when young artists, writers and historians would meet in Parys Filippi's sculpture atelier. It was then that he made friends with Jozef Szujski, the would-be co-founder of the Kraków historical school who inspired Matejko's concept of painting. Matejko won international fame and recognition before he turned thirty. French critics included him among Europe's top representatives of historical painting. His first success was the gold medal for Skarga's Sermon at the annual Paris Salon in 1865. Two years later he won the gold medal of 1st class at the Universal Exhibition in Paris for Reytan at the Sejm in Warsaw in 1773. The painting was bought by the Emperor of Austria, Franz Josef. Also in 1867 Matejko received the Ritterkreuz Franz Josef Ordens. Starting from 1865, he paid several visits to Paris (in 1867, 1870, 1878, 1880) and Vienna (in 1866, 1867, 1870, 1872, 1873, 1882, 1888). In 1873 he also travelled to Prague and Budapest, and in 1878-9 and 1883 to Italy, stopping at Venice, Rome, Florence and other towns. In 1872 he spent a few months in Istanbul, where he produced his only Oriental landscapes. In 1873 he was offered the job of Director of the Academy of Fine Arts in Prague. His refusal prompted the Kraków School of Fine Arts to make him a similar offer. He accepted, and was the School's Director from 1873 till his death. Among his students were the leading artists of Polish modernism: Jacek Malczewski, Stanisław Wyspiański, Józef Mehoffer. Besides his pedagogical work, Matejko was heavily involved in the restoration of Kraków's old architecture. He sat on the restoration committees for Wit Stwosz's gothic altar at St Mary's Church (1867-69), the Sukiennice / Cloth Hall (1875-79), the Wawel Castle (1886) and St Mary's Church (1889). He also took part in research work and made inventory drawings at the opening of graves of King Jan Kazimierz (1869), Queen Jadwiga (1887) and Cardinal Olesnicki (1887) inside the Wawel Cathedral. In 1872 he became extraordinary member of the Academy of Ability in Kraków and sat on its commission to develop an architecture conservation bill. He also designed a polychrome for St Mary's interiors. Made in 1889-91, it was an innovatory project of monumental importance for the revival of polychrome painting in Poland. In 1887 he funded a scholarship for a student of Kraków's School of Fine Arts who would desire to get educated in stained-glass art. Matejsko was a regular participant of exhibitions organised by the Society of Friends of Fine Arts in Kraków (from 1855) and Lvov (from 1868), as well as at Kraków's Science Society (from 1864) and the Warsaw Society for Encouragement of Fine Arts (from 1861). He had his paintings shown at numerous international exhibitions at Europe's major 19th century artistic centres, such as Paris (1865, 1867, 1870, 1874, 1875, 1878, 1880, 1884, 1887), Vienna (1866, 1867, 1869, 1870, 1872, 1873, 1875, 1877, 1878, 1880), Berlin (1879, 1884, 1891, 1893), Prague (1868, 1870, 1873,1876), Budapest (1872, 1877, 1879), London (1871) and Petersburg (1879). Of the large number of prizes awarded to him, the most prestigious was the Grand Honorary Gold Medal at the Universal Exhibition in Paris in 1878. After The Union of Lublin was shown in Paris in 1870, Matejko received the Cavalier Cross of the Legion of Honour. He was also honoured with a "Kunst-medaille" in Vienna in 1873 and with the Austrian imperial medal "Pro litteris et artibus" in 1887. The same year Jagiellonian University made him an honorary doctor in recognition of his knowledge in the field of history. In 1883, after he offered the painting Sobieski on the Outskirts of Vienna to Pope Leon XIII as a gift from the Polish nation, he was honoured with the Commodore Cross of the Pius IX Order. Matejko's position as one of Europe's top painters of the time was also confirmed by the fact that he was awarded membership of a number of prestigious organizations, including the French Académie des Beaux-Arts (1873) as well as the Institut de France (1874), Academy of Art in Berlin (1874), Raphael Academy in Urbino (1878), Wiener Kunstlergenossenschaft (1888). His compatriots' recognition for his patriotic attitude was expressed at a 1878 ceremony, during which the Mayor of Kraków, Mikolaj Zyblikiewicz, presented Matejko with a sceptre symbolizing his spiritual rule of the nation at an interregnum. He was also made an honorary citizen of the cities of Lvov (1869) and Kraków (1882). In 1882 the Home Department in Lvov funded the Matejko foreign studies scholarship for a School of Fine Arts student of his choice. The same year his name was given to a square where a new School building was erected (nb. the plot had been the town authorities' gift to Matejko, who then offered it to the School). In 1883 an anniversary exhibition showing almost one hundred of his works was mounted to mark twenty-five years of his artistic career. One year after his death, the Polish nation paid a tribute to him by preparing a monumental exhibit of his artistic oeuvre; the exhibit was shown at a designated pavilion at the Universal National Exhibition in Lvov in 1894. Matejko's first historical paintings, dating from 1853-61, are anecdotally descriptive, with somewhat schematic compositions and static, conventionally posed and gesturing groups of people. The outlines are precise, the details are meticulously painted, and the surfaces are smooth owing to sparse application of paint. As time went by, these early works started to show the painter's desire to present individual traits and diverse emotional reactions and to make the depicted scenes more dramatic (Sigismund I Bestowing Nobility on the Professors of the University of Kraków, 1858; The Poisoning of Queen Bona, 1859; Jan Kazimierz at Bielany, 1861). These early works already reveal Matejko's passion for history and penchant for accurate recreation of old costumes, interior designs, furniture and various accessories. The rapid process of his maturing as a man and an artist took place in the years preceding the outbreak of the January 1863 Uprising. The patriotic demonstrations in Warsaw and Poles' revived hopes and aspirations to independence deeply affected the young artist's imagination. Completed in 1862, Stańczyk marks a breakthrough in his artistic development and is the artistic creed of the twenty-four year-old painter. 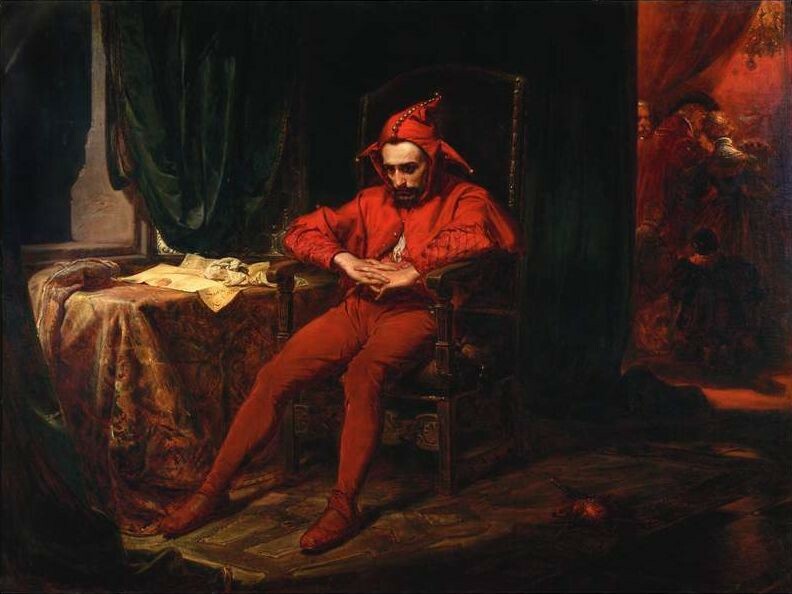 Matejko's depiction of the royal jester, lonely in his painful thoughts over the political consequences of the loss of the easternmost fortress of Smolensk in the 1514 war with Moscow, makes him a symbol of political perspicacity and wisdom, a personification of civil conscience and of the unceasing concern for the fate of the country. It is the first manifestation of Matejko's historiosophical thought, driven by a profound understanding of continuity of historical events and their mutual relationships. Like Jozef Szujski, the would-be founder of Kraków's "historical school", Matejko believed that Poland declined in the late 18th century because its earlier military victories had not been built upon and the state policy makers had erred. Stańczyk and the two paintings that followed, Skarga's Sermon (1864) and Reytan at the Seym in Warsaw in 1773 (1866), form a certain historiosophical sequence: from the prediction of the national undoing to warning to the tragic fulfillment. A 17th century political treatise, Piotr Skarga's Parliamentary Sermons inspired Matejko to paint a picture with Skarga, a Jesuit and court preacher of King Sigismund III, as its main protagonist. The scene shows Skarga condemning the lawlessness and egoism of nobility and magnates the way he did in the Parliamentary Sermons and calling for action to save the country from total anarchy. The warning proved futile, and Skarga's prophetic vision got fulfilled in the late 18th century, partition treaties deleting Poland from the map of Europe and its territory divided between Russia, Prussia and Austria. This historical event was symbolically presented in Reytan at the Seym in Warsaw in 1773, a painting showing the dramatic protest of the title hero Tadeusz Reytan, the Member of Parliament from the region of Nowogrodek, against the ratification of the partition treaty. Skarga's Sermon was intended to move the consciences of Poles; Reytan was more than that - a challenge to magnates, an accusation of some of them of treason and of selling their to foreign powers. As such, it echoed loudly, the public accusing Matejko of, among other things, "exploiting a historical scandal for popularity's sake". With Reytan, Matejko closed down the period of ideological settling of accounts with the past and of looking for an answer to reasons for Poland's decline. At a time of prevailing disappointment and low spirits of the Polish people after the downfall of the January uprising in 1864, he radically changed the mood of his art and started to paint visions of the former splendour of the Commonwealth and its military glory; he did so to perpetuate faith in the legitimacy of aspirations for independence and to uplift the hearts and minds of Poles. He would remain faithful to these ideals until the end of his life, painting monumental canvases to show Poland's political and military successes, and using historical themes to share his reflections on current political events. Painted in 1869, The Union of Lublin illustrates a major 1569 historical event - the combination of Poland and Lithuania into a single political entity. Matejko wanted to recall the former greatness of Lithuania, the country which entered the union with Poland as an equal-rights partner. It was his response to the wave of cruel repressions against Lithuanians after the suppression of the January Uprising, and his protest against Russia treating Lithuania as an ethnically Russian territory. The Battle of Grunwald from 1872-78 shows one of Poland's greatest military victories over Germany - the total crushing of the military power of the Teutonic Order by the combined Polish, Lithuanian and Russian forces in 1410, a military success that was not, regrettably, translated into political gains. The picture was painted at a time of Prussia's growing European hegemony after the victorious 1870 war against France. It was also Matejko's response to the rising wave of Germanization of Poles in the territories annexed by Prussia. By painting King John III Sobieski under Vienna (1883) and offering it to the Pope, Matejko wanted to remind Europe of a nation which had saved Austria and the entire Christian community from the threat of Turks two hundred years before and which later lost its statehood partly as a result of the expansive politics of the Habsburgs. Similar ideas - the triumphs of the former Commonwealth over its present-day partitioners - were conveyed in two monumental canvases: King Stefan Batory under Pskow from 1872 and The Prussian Homage from 1882. The former refers to Poland's victorious war against Russia, fought in 1578-82 in defence of Livonia /Inflanty/ and Belarussian territories of the Great Duchy of Lithuania. Matejko painted Muscovite envoys kneeling in front of Stefan Batory. The king is shown as an embodiment of the power and majesty of the Commonwealth. The Prussian Homage shows the liege homage paid in 1525 to Sigismund I King by Albrecht Hohenzollern, the first ruler of the former lands of the Teutonic Order, now turned into a secular duchy of Prussia. Compared with European historical painting, Matejko's great canvasses stand out by strength of their profound historiosophical ideas, largely a result of the political situation of the country and of the need to defend the endangered national survival. By recreating scenes from the past, Matejko aimed to show "an era condensed in one moment". Symbolically referring to causes and consequences of events, he wanted to provide a historical synthesis and to convey the dramatic conflicts of historical powers and human fates. This objective took precedence over purely artistic values and made him depart from strict fidelity to historical fact by, for example, introducing persons who did not take part in the events but were spiritually close to them. Matejko's last period of artistic activity reveals his renewed desire to settle accounts with Poland's past. Alongside the glorifying series of twelve oil sketches titled A History of Civilisation in Poland, he paints Kosciuszko in the Battle of Raclawice, 1888, The Constitution of 3rd May, 1891 and Jan Kazimierz's Oaths, 1893, three paintings which talk symbolically of unfulfilled hopes and lost opportunities for the nation's moral revival and averting the disastrous partitions. Kościuszko in the Battle of Racławice addresses the heroic effort of peasants from the villages around Kraków in the victorious battle of Kosciuszko insurgents against Russian troops in 1794. Kościuszko, the head of the uprising, promised the peasants a betterment of their economic situation and greater individual freedoms, a promise that took long to fulfill and, as a result, discouraged the peasants from taking part in fighting and, longer-term, increased social tensions in the country. 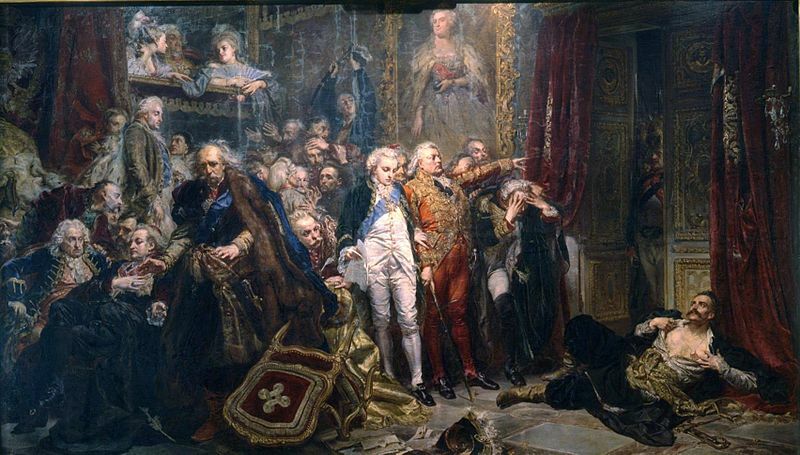 The Constitution of 3rd May shows the ceremony of King Stanislaw August Poniatowski swearing in the Constitution - the most advanced fundamental document in Europe of the time - enacted in 1791 to save the country from a total loss of sovereignty. While the overall mood is that of solemnity, there is a sense of foreboding in the presence of would-be leaders and participants of the Targowica Confederation, a group established under the patronage of Russia to suppress the reformatory achievement of the Four-Year Sejm (most notably the Constitution) and to defend nobility's Golden Freedom. Jan Kazimierz's Oaths, Matejko's last painting (work on it was interrupted by his death), depicts the scene of the solemn oaths taken by King Jan Kazimierz (Jan Casimir) in 1659, in the face of Poland's ultimate surrender to the Swedish invasion that began the year before. Jan Kazimierz announced the Virgin Mary Queen of Poland and Lithuania, entrusting both nations in her care as well as promised profound reforms of the state system, such as the restoration of the Sejm stability and improvement of peasants' lives after the war had been won. The King's oaths remained another unfulfilled promise. Growing anarchy, rebellions of the nobility and magnates and never-ending wars prevented any reform, and in 1668 the embittered king abdicated and left Poland for ever. His core work, Matejko's monumental canvas was complemented by dozens of lesser pictures. These were inspired by ancient chronicles (most notably those by Jan Dlugosz and Marcin Bielski), the desire to commemorate national anniversaries, or the artist's thoughts on the past. He was also commissioned to paint specific historical events. A review of these minor paintings reveals Matejko's defined historical interests. 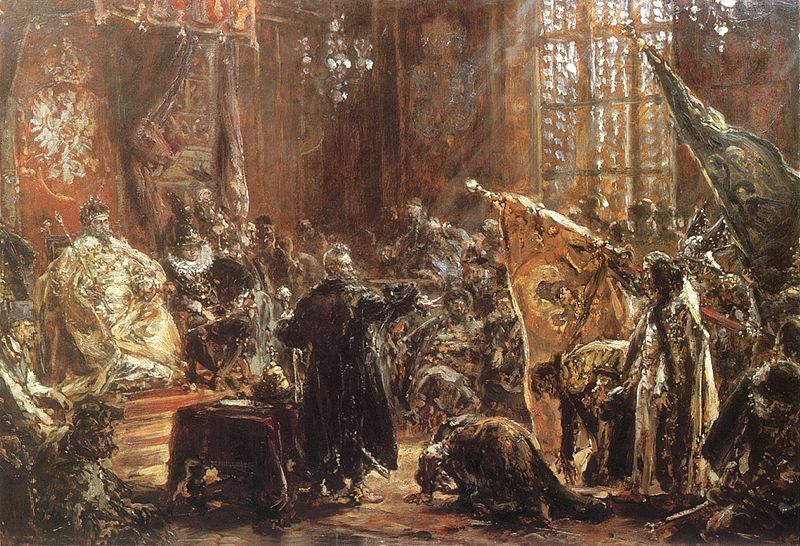 There is a particular focus on the history of the Piast dynasty, with a predilection for sensational and dramatic events as depicted in Prince Przemyslaw's Death in Rogozno, 1875; Władysław Łokietek Breaking off the Agreement with the Teutonic Order at the Assembly in Brześć Kujawski, 1879; Bolesław Chrobry and Swiatopełk at the Kiev Golden Gate, 1884; Piotr Wlast Brings The Cistercians to Poland, 1888; Murder of St Stanislaus, 1892). The flowering of Polish culture and science in the Renaissance under the rule of the last two Yagiellons, Zygmunt I Stary / Sigismund I the Old and Zygmunt August / Sigismund August was Matejko's another favourite area of interest, inspiring, among others, such paintings as Installation of the Zygmunt Bell Inside the Tower of Kraków Cathedral in 1521, 1874; The Babinska Republic, 1881; The Founding of the Lubranski Academy in Poznań, 1886). Like many other 19th-century painters, Matejko was eager to address the famous love affairs of the past. Particularly popular with the masses was the dramatic relationship of Zygmunt August and Barbara Radziwillowna - the king's love for his subject, a Lithuanian princess, his uncompromising struggle for the Sejm to recognize their secret marriage, and the young queen's death shortly after the coronation. Matejko took up this theme, addressed also by Józef Simmler and Wojciech Gerson, many times in such paintings as Zygmunt August in the Vilnius Garden, 1865; Zygmunt August and Barbara at the Radziwill Court in Vilnius, 1867; Zygmunt August Introduces Barbara Radziwillówna, watercolour, 1858; Twardowski Raising Barbara's Shadow for Zygmunt August, 1884. Another theme, typical of the time and rooted in Romanticism, were portraits of eminent persons - rulers, politicians, scholars and artists - of outstanding personalities, who towered above the society's average. Konrad Wallenrod, 1863; The Blind Wit Stwosz with Granddaughter, 1865; Sędziwój the Alchemist, 1867; Mikołaj Kopernik, 1873; Wernyhora, 1883-84; Zamoyski under Byczyna, 1884 are among Matejko's finest works of this kind. Matejko's historical painting project went much beyond the academic convention which was taught to him when he was a student in Kraków, Munich and Vienna and which he encountered at international art exhibitions. What particularly set his canvases apart from the contemporary historical paintings was his attitude to past ages. He was not one to look merely for a colourful, sensational or sentimental anecdote. He understood history as a continuous and essentially dynamic process, and believed it the artist's job to study historical events in detail in order to produce their solid evaluation and a moral assessment of involved people and political forces. His aiming for a synthesis of universal learnings from history made him depart very early on from detached and accurate illustrations of the external, visual side of past events. Instead, he was interested in extracting from the darkness of ages the live and feeling human being whom he would often present in the midst of clashing political interests or moral reasons. Matejko's individual style of painting, which came to the fore around the mid-1860s, is usually traced down to his fascination with the gothic sculptures by Wit Stwosz and late Renaissance paintings, particularly those by Paolo Veronese and Titian. Matejko chose to paint crowded, panoramic scenes which resembled theatre performances played in the foreground, with no background, and which were powerfully expressive, if not lofty, dramatically perfect in terms of arrangement and rendering of poses and gestures, had dynamic outlines and spectacularly intensive colours (he would often use discordant local colours) and, more than anything, showed expressive physiognomies and personalities. Indeed, most of Matejko's biographers name the latter quality as the key most individual characteristic of his works. Stanisław Witkiewicz had a point when he wrote about the unique race of people created by Matejko – a heroic race of extreme willpower that yielded to great passions showing through in solemn gestures or excited glances. Matejko is commonly considered to have reached a peak in terms of artistry and technique in 1865-1884. His later works reveal a gradual deterioration of his individual style into mannerism, the compositions lacking in focal points and their clarity lost in a mish-mash of outlines and little spots of colour. Always dynamic yet accurate, his outlines become rapid and nervous. He narrows down his colour palette, going for hues of reds and browns. All these things make many of his late paintings lack in expressiveness which used to be the fundamental characteristic of his style. While it is often associated with the academic trend of historical, "grand manner" painting, Matejko's work does not yield to simple or straightforward definitions. Its romantic, spontaneous imagination, passionate feelings, pathos and strength of expression made it a stand-alone phenomenon in Polish and European art of the latter half of the 19th century. Growing out of Matejko's ardent patriotism, his profound knowledge of history and love for the artistic heritage of the past, his art was more than anything his way of serving his country and supporting the goal of national independence. Matejko combined the scientism of the 19th-century historicism in re-creating historical realities with an his own assessment and interpretation of past events and a subjective way of presenting them in paintings. In a way, his creative artistic visions are akin to the proto-expressionistic conception of art as the expression of the artist's emotions and his attitude to the world. In the other stream of his work - the portraits - Matejko also developed his own, individual style, departing from the academic convention which was dominant in the second half of the 19th century. Early on he had portrayed exclusively representatives of his own, burgher circles - his friends, family and respected, affluent Kraków businessmen and civil servants (Portrait of Kazimierz Stankiewicz, 1857; Portrait of Paulina Giebultowska, 1858; Portrait of Parys Maurizio, 1859; Portrait of Wiktoria Kosinska, 1859). These restrained, accurate and diligent images painted mostly in 1857-61 show well-off, modest people of generally dispassionate, calm faces. Matejko, then around twenty, was too young to penetrate through his models' emotions, even if his job was not made easy by their average, banal personalities. One portrait stands out in its power of expression, Portrait of Maria Matejko from 1859, showing the artist's sister turned twenty-three, her gaze quizzical and at the same time sorrowful. Matejko's growing fame as a brilliant representative of patriotic historical canvasses also fuelled his reputation as a painter of portraits and so Kraków's top aristocratic families as well as the town's intellectual and social elite flocked to have their effigies immortalized by him. With the 1864 Portrait of Jozef Dietl, Kraków's distinguished doctor, professor and chancellor of Jagiellonian University, Matejko changed the style of his portraits, moving towards greater expression and elegance. Dietl's portrait was followed by dozens of official effigies of University professors and chancellors, mayors of Kraków and speakers of the Home Parliament, including that of chancellor Karol Gilewski, 1872; speaker of the Sejm and governor of Galicja Alfred Potocki, 1879; chancellor Józef Szujski, 1886 and 1888; speaker of the Sejm and mayor of Kraków Mikołaj Zyblikiewicz, 1887; chancellor Stanislaw Tarnowski, 1890. None, however, equalled Dietl's portrait in monumentality of the model or psychological depth. Despite the plain, or even brutal, sharp and sculpture-like depiction of Dietl's face and the seemingly unattractive frontal approach, this portrait, unique and individualized, reflects very well the chancellor's stature and power. Matejko was convinced that it was not solely physical resemblance that made a portrait truthful. Indeed, this function could have well been fulfilled by photography with its functionality of producing faithful copies of models. The portrait, in contrast, needed to reflect the complex and often deeply hidden spiritual life. When setting out to paint a portrait, Matejko made an effort to identify his emotional and intellectual attitude to the model so that he could create a timeless synthesis of physiognomy and personality. His focus on the emotional side produced a truly individual style of portrait painting. It departed from the academic convention of idealized images, at the same time falling short of the standards of realism. His images of contemporary aristocrats, intellectuals and politicians, while being faithful, observation-based representations, show solemn poses, gestures and facial expressions, reflecting the artist's deep and intensive spirituality. Emerging from rich and elegant backgrounds, his models are often evocative of protagonists of historical dramas. This is true, for instance, of the 1890 portrait of Katarzyna Branicka nee Katarzyna Potocka, the commonly respected first lady of the Kraków society of the time, known for her charity work. Her dignity and social status of a Polish matron are emphasized by the hieratic pose, the serious black of her modest yet refined dress and the decorative interiors, the ornamental table and the draped curtain in the background evocative of Baroque court portraits. Despite the profusion of stylish objects the viewer's attention is drawn, however, to the elderly woman's face, excellently portrayed and noble in expression. The same tendency to make the model monumental, to convey his psychology and to show him in a sophisticated pose and surroundings can be observed in Portrait of Piotr Moszyński (1874), the political leader and former exile, community champion, collector of art and national keepsakes (as suggested by the wall display of panoplies); Portrait of Marcelina Czartoryska (1874), the philanthropic aristocrat, excellent pianist and Chopin's student, depicted by an open piano above which there is a medallion with the composer's death mask. Like many other official portraits, these canvases juxtapose the richness of decorative objects of masterfully-rendered gloss and textures of various fabrics with the simplicity and deep black of the characters' dress that serves to emphasize their expressive, age-marked faces and hands. Matejko was closer to realism in his portraits of members of his own stratum, the wealthy burghers and intelligentsia - with one exception, however - that of his own family. He painted his wife and children the way nobility had their portraits made, enhancing the effect with spectacular costumes modelled on the past dress. Portrait of Wife in the Wedding Dress (1879) is a case in point. It shows Teodora Matejko wearing an impressive costume designed by her husband to resemble the robes worn by Polish nobles. Matejko's attempt to capture the refined gestures and dignity of the young wife is coupled with a penetrating psychological study of her strong personality, her pride and awareness of good looks and lack of a profound spirituality. Matejko adopted the same historic style to paint his children in Portrait of the Artist's Four Children, 1879; Portrait of Daughter Helena with a Sparrow Hawk, 1882-83; Portrait of Daughter Beata with a Canary, 1882; Portrait of Son Jerzy on Horseback, 1882). The effort to achieve an effect of formality through painstakingly pre-arranged poses and spectacular costumes prevails over the attempt to capture the psychology of the models - even though Matejko knew them so well. Again, the 1882 portraits were painted in the vein of the old effigies of Polish nobility, the splendid postures and colourful costumes worn by the models making them look unsuitably dignified and solemn for their age. In contrast, Portrait of the Artist's Three Children from 1870 is more direct in approach and has a distinct touch of lyricism about it. When painting portraits of members of his own social class, Matejko never idealized their appearance nor tried to upgrade their social status through exquisite dress or objects. He used simpler and more modest arrangements, frequently settling for the conventional bust against a neutral background, subduing the range of colours, giving up picturesqueness and decorativeness and focusing on facial expressions. This is true of the portrait of his brother-in-law Leonard Serafinski, notary, judge and chairman of the Bochnia County Council, and of the images of Ludwika and Henryk Groppler, Matejko's relatives living in Constantinople. An unrivalled power of expression was achieved in two portraits painted a year before Matejko's death, that is in the period when his historical paintings were in retreat. One of them is Portrait of Henryk Krajewski, the Warsaw lawyer and political leader who worked with Romuald Traugutt in the January 1863 Uprising and was a three-time exile in Siberia. Instead of a conventionally posing model, there is a man who stopped reading a book for a brief moment to cast a cursory glance at the viewer. A reflection on his reading seems to be passing through his face. Although seemingly casual, the image of the model makes one think that the artist penetrated deeply into the model's mind and understood the gaze of his wise, thoughtful eyes. The result of this extremely simplified compositional structure is a noble, very human and true study of old age of a man who bears the marks of the vicissitudes of life and personal failures, yet perseveres, his thoughts flying high and his desire to live on strong. The other picture that makes Matejko a master of realistic perception of man is his 1892 Self-Portrait. This deeply saddening, reflective image was painted at a time when he felt increasingly isolated and lonely, lacking the understanding of his contemporaries. Painted at the age of just fifty-four, it shows a prematurely aged man who is exhausted by titanic work. His deeply wrinkled face with piercing black eyes is marked by sadness and bitterness, and his whole figure emanates an unusual, majestic dignity. The thick books supporting his palette and brushes are indicative of the artist's passion for history and of his vocation as the painter of national history. Like Krajewski's portrait, this self-portrait is set apart from Matejko's earlier pictures owing to its immense simplicity and economy. The gaunt face, the vivid, attention-grabbing shine of the eyes and lean, work-warn hands emphasize the painting's expressiveness and the depth of its psychological wisdom. Matejko's artistic output is huge and encompasses over three hundred oils (portraits as well as historical, religious and allegorical paintings) as well as a few hundred drawings and sketches, including the famous and popular Gallery of Polish Kings, 1890-92. Matejko was a distinguished Pole, a great artist, an outstanding teacher and a protector of Kraków's monuments of the past. His achievement cannot be analysed in purely artistic terms, for it is inseparable from its function then and there. His synthesis of national history has made it for ever to the canon of historical knowledge and patriotic education of subsequent generations of Poles. The crowds, including lots of schoolchildren, that visited the exhibition of his historical canvasses at the Warsaw National Museum on the centenary of his death in 1993, were the best testament to this.